1981, Moustapha Akkad, 186 minutes. 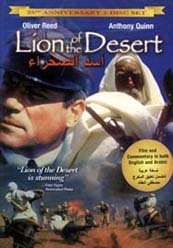 The year is 1929 and dictator Benito Mussolini (Rod Steiger) is still faced with the 20-year long war waged by Bedouin patriots to combat Italian colonization in Africa. Mussolini appoints General Rodolfo Graziani (Oliver Reed) governor of Libya, confident that he can crush the rebellion and restore the glories of Imperial Rome. Inspirational in the Bedouin resistance toward the oppressors is the leadership of one man--Omar Mukhtar (Anthony Quinn). A teacher by profession, guerrilla by obligation, Mukhtar has committed himself to a war that cannot be won in his lifetime. This exciting epic also stars Irene Papas and John Gielgud and was created by Moustapha Akkad who created another epic film, The Message. Audio Commentary with Producer/Director Moustapha Akkad in English and Arabic.